We reviewed iBasso's D10 Cobra, a well-featured DAC and headphone amplifier with both USB and S/PDIF inputs, as well as a line input. 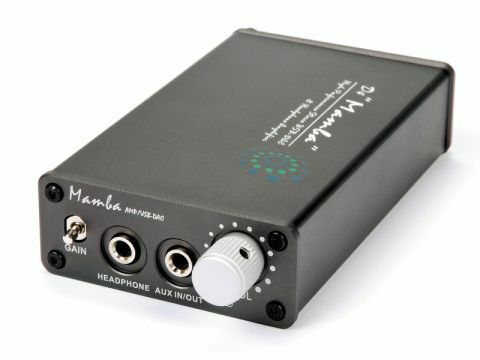 The D4 Mamba is a very similar device, but lacks the S/PDIF option and comes in a slightly smaller case, 92 millimetres long, instead of 104 millimetres. (The other dimensions being a width of 55 millimetres and a thickness of 21 millimetres). Small it may be, but this device includes not only a USB receiver chip, but also a pair of Wolfson DAC chips and enough op-amps and passive parts to match the performance of full-size hi-fi components. It derives power either from the USB input or from an internal PP3 battery. This is another difference from the D10, which has a built-in rechargeable battery. iBasso estimates the battery life at nine hours: we actually got a little more than that, but, of course, batteries vary from make to make and listening levels will have an effect too. As with the D10, it's possible to tweak the unit by replacing the internal op-amps. We didn't try it – the fitted ones are good parts and we didn't have any suitable replacements handy – but it's nice to see the odd manufacturer catering to die-hard tweakers. iBasso even supplies a tool for removing the front panel, which you will need to do to change op-amps or to change the case: a replacement black case is supplied in case you don't like the default charcoal grey. Operation is straightforward once you're used to the fact that the 'Aux' socket is an output when the USB digital input is used, or an input when the source is analogue. Obviously a USB input is there for the computer-based music collector, so we hooked up a PC and had some fun. With lossless files stored, a computer is a perfectly good 'bit bucket', but some kind of external DAC is pretty much obligatory unless you have one of the few really good soundcards (most of which cost a lot). For home use, one might choose something larger than the iBasso with phono socket outputs, such as the Cambridge Audio DACMagic, but with a laptop computer this unit really does provide audiophile quality on the move. In fact, with some upmarket Shure earphones plugged in, we were hardly aware that we were listening to a portable system. Taking things to extremes, we connected up a pair of Grado GS1000s and were confident enough of what we were hearing to contemplate doing critical editing and mastering in rural surrounding. Although the very finest details of instrumental timbre and stereo imaging may be better brought out by some larger and dearer units, this little piece of kit has an astonishing command of the frequency range and also of musical dynamics, which it reproduces with real aplomb. As an analogue amplifier, it is no less confident. It doesn't give quite the same sort of quality lift as most portables, but its increased level and drive ability do still result in improved clarity and definition. If you don't need the D10's S/PDIF input, this is a very fine way to improve the quality of music on the move.